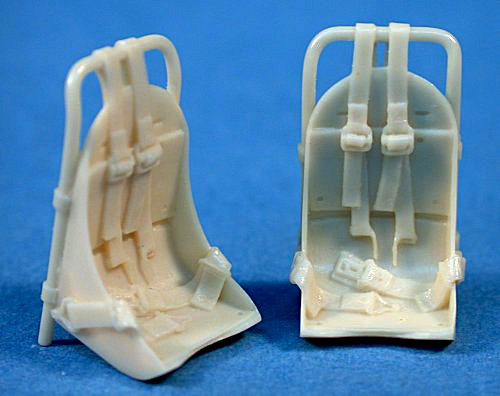 The other two details sets recently released by Ultracast are 1/48 scale pilot’s seats for the Lockheed P-38 Lightning. Ultracast do two different sets, one cast with harness and one and one without. Set 48223 is cast with a harness in place. Ultracast has cast the seat as a single piece that incorporates the frame on which the seat itself is mounted on. From what I can find in my reference books and the net, the seat appears to be a faithful reproduction of the one-to-one-scale ones and it exhibits crisply cast detail on the seat itself as well as the harness and buckles. The belts are correctly portrayed in that they come up from the back of the seat and over the mounting frame itself and down onto the seat. The belts have been cast so that they are thick enough to easily detail paint and then apply a wash to so that they stand out without appearing over scale. Ultracast’s seat is easily a vast improvement over ones provided in both the Haesegawa and Academy P-38 kits. Unlike the kit seats, the sides of the seat pan and seat back are very, very thin and truer to scale. Preparation is easy as Ultracast have cast the seat on a very thin web that has a definite separation between the part and the cast pour. There is also a transparent wafer of resin between the seatback and the mounting frame. Simple but careful scribing with a sharp exacto hobby knife will separate the seat from the web and remove the wafer of resin around the seat frame; following this a wash in warm water and detergent will see the seat ready to paint. You get two seats per pack for $9.95 (Canadian Dollars) and given that the Ultracast’s seats are far better that what you get from either Hasegawa or Academy I’d say that it is money well spent.